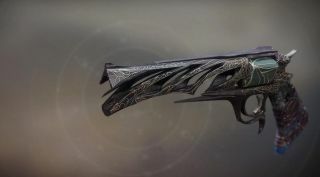 Four weeks into Destiny 2: Forsaken's lifespan, and a new Exotic hand cannon has appeared in the ecosystem, which Guardians have been looking for since the expansion's launch earlier this month. Malfeasance is a primary weapon with five perks, the non-randomosed one being Explosive Shadow, where every fifth shot against the same enemy deals major combustible damage. The path towards gaining Malfeasance is a multi-step process, however, and not necessarily a self-explanatory one either, so we've put this guide together to take you through it, bit by bit. Be aware that you'll need to have access to The Dreaming City, Destiny 2: Forsaken's new endgame Patrol Zone, but you can learn about how to unlock The Dreaming City in our separate guide here. Done that? Good, let's get started. The first part of the search for Malfeasance is fairly straightforward. Simply play rounds of Gambit, and wait for an Ascendant Primeval boss to spawn in. This is the Corrupted Servitor boss that was the final enemy of Destiny 2: Forsaken's campaign, and there's a chance it can show up during Gambit whenever the enemy team uses their motes to spawn enemies in your zone. The Primeval has a chance to drop a Quest Step called The Seething Heart when killed, and this begins the Malfeasance hunt in earnest. Go and visit The Drifter at The Tower to begin the first part of the quest. The Drifter will give you a new Quest Step called The City of Secrets, which will ask you to kill either 25 Taken bosses or mini-bosses in The Dreaming City (hence why you need to have access to the area). A lot of Guardians appear to be suggesting that the Lost Sector known as Chamber of Starlight represents the fastest and most effective way of farming this requirement, as it's a quick activity with a Taken Witch boss at the end who's easy to defeat. Rinse and repeat this 25 times, and you'll unlock the next task in the Quest Step. Defeating all 25 Taken bosses will unlock a special version of The Corrupted Strike in The Dreaming City, with a power level requirement of 580. This variant of the Strike features a new ending against a completely different boss fight in a new (story spoilery) location, but you can run it with up to five other Guardians if you're struggling to make it to the end. Upon completing The Corrupted, you can return to The Drifter back at The Tower for the next Quest Step, Business as Usual. Business as Usual asks you to go back into Gambit to complete matches and deposit motes during each round of the PvP/PvE hybrid mode. Motes are the black and white triangular items that drop from enemies in Gambit, and you can pick them up to deposit at the nearby station to satisfy the Quest Step's threshold. Take note, however, whenever you die, the progress rate of your mote counter decreases, so try and be cautious in how you collect and bank them during matches. Completing this, alongside the match play requirements, will unlock the fifth and penultimate Quest Step called Lights Out. Bit of a needlessly complicated one, this, but you basically need to rack up kills in Gambit and either invade the enemy during matches to get four kills on other players, or have an ally completely wipe the other team during a single invasion three times. The former task of that either-or quest step is definitely the easier objective, so I'd focus on trying to invade whenever you can in Gambit, and getting as many kills as possible. When Lights Out is completed, the Dark Weapon Core Quest Step lets you go and talk to The Drifter in The Tower to receive your reward, Malfeasance. Phew!